Cabbage, Savoy- The thin, light texture, sweet taste, and crinkled leaves make Famosa one of our very favorite Savoy Cabbages. You can turn it into kraut, excellent slaw, or cook it down. Savoy cooks faster than a regular cabbage, so take care not to overcook it. Make an Asian slaw by shredding the cabbage and dressing it with soy sauce, rice vinegar, sesame oil, chili, garlic, and fresh grated ginger. Chicory, Pan di Zucchero- The name means ‘sugarloaf’ in Italian and its in the chicory family along with radicchio. This upright, green chicory is far more mild and sweet than its sibling radicchio. It will store for incredibly long periods of time in a plastic bag in the fridge, so you can cut a wedge off and put the rest back for later. You can eat Pan di Zucchero raw- shredded and dressed with a light vinaigrette, or cooked for a sweeter and more savory flavor. We recommend a quick, hot fry to quickly sear and caramelize the edges rather than a slower saute, which will just wilt it without the browning. Leeks- Related to garlic, shallots, and onions. Leeks are a tremendous treat in the late winter when many other crops in the field have long since withered or frozen. Leeks hold strong through frigid winters and provide a tremendous amount of fresh food inch-per-inch out of a garden or farm and a more delicate flavor than onions in the kitchen. The tall, upright shape of leeks means that you can pack a lot of food and nutrition into a small amount of space- a single foot of bed space can yield 4-5 mature leeks! Leeks are a great choice for local food systems and resilient gardeners alike. Radish, Daikon- These giant cylindrical radishes hail from Southeast Asia. They are used extensively in Japanese cuisine fresh, pickled, dried, or simmered. Many American farmers use daikon as a cover crop/pasture forage; the large, aggressive roots break up hard soils, and the tops serve as animal fodder. The hot summer caused some unusual dark banding and hollowness in our daikon roots, mostly near the tops and bottoms…hence the cut-down log shape of your daikon. Parsnips– boil, steam, bake, fry, roast…parsnips do it all. There is a friendly debate going on on the farm: which is more delicious oven baked with olive oil & salt or baked with heavy cream and topped with a fresh grate of nutmeg. Let us know what you think! 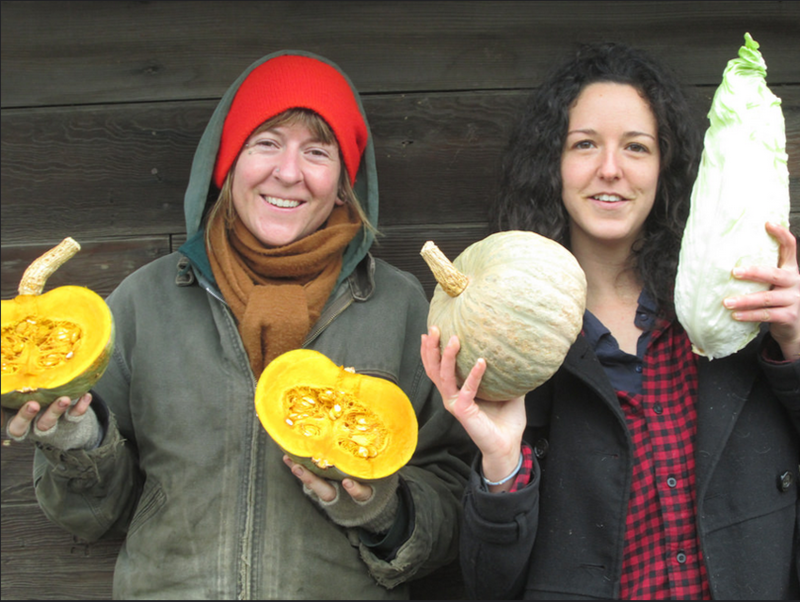 Winter Squash, Blue Kuri- This squash has a truly international pedigree! Its a Japanese Kabocha type that our friends from Adaptive Seeds near Eugene originally sourced from ”Wim Brus, a seed grower for Bingeheimer Saatgut in Germany. He spent many years selecting for quality on his farm in the mountains outside Bologna, Italy.” We hope you enjoy it on your table- Kabocha are known for their sweet, dry flesh with a nutty flavor. A classic Japanese preparation (and a sublime treat) is to cut the squash into somewhat thin wedges and roast at high temp until the outer edges are starting to brown and crisp…the interior will be delightfully fluffy and sweet. Yum! That’s your Pan di Zucchero, chicory on the right and your Blue Kuri, winter squash on the left.